The Paris climate deal already is a step in the right direction, but will apparently be not sufficient to prevent major damage to ecosystems and human livelihood. 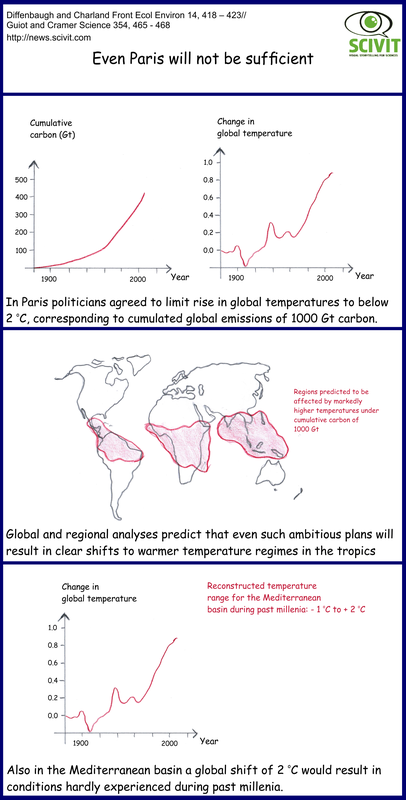 The deal encompassed a common commitment to keep increases in global temperatures compared to pre-industrial levels below 2 oC. This goal is currently estimated to be achievable with a limitation of the global cumulative emission of carbon to 1000 Gt. Since the beginning of the industrial revolution we have transferred about 600 Gt of carbon into the atmosphere and we have reached an increase in global temperatures of about 1 oC. Carbon release and global temperatures increased in recent decades particularly strong. Limiting cumulative emissions to 1000 Gt and temperature rise to below 2 oC is therefore relatively ambitious and is only achievable by drastic economic transformation. Studying the consequences of the target temperature limit, Diffenbaugh and Charland predict that even a temperature increase of below 2 oC will have severe effects in particular for tropical regions. Here variability of temperature is particularly small; shifts in temperature therefore are particularly notable and have clear effects. From studying temperature variability of the Mediterranean basin in past millennia, Guiot and Cramer predict that an increase of 2 oC will result in a completely novel local climate regime. They predict a clear increase of persistent droughts threatening ecosystems and livelihood of the region.